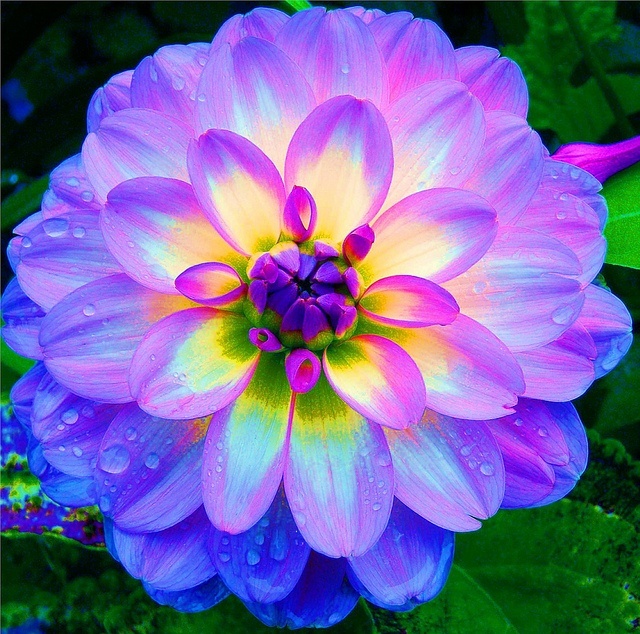 Dahlia is a genus of bushy, tuberous, herbaceous perennial plants native to Mexico, Central America, and Colombia. A member of the Asteraceae or Compositae, dicotyledonous plants, related species include the sunflower, daisy, chrysanthemum and zinnia. There are at least 36 species of dahlia, with hybrids commonly grown as garden plants. Flower forms are variable, with one head per stem; these can be as small as 2 in (5.1 cm) in diameter or up to 1 ft (30 cm) ("dinner plate"). This great variety results from dahlias being octoploids—that is, they have eight sets of homologous chromosomes, whereas most plants have only two. In addition, dahlias also contain many transposons—genetic pieces that move from place to place upon an allele—which contributes to their manifesting such great diversity.